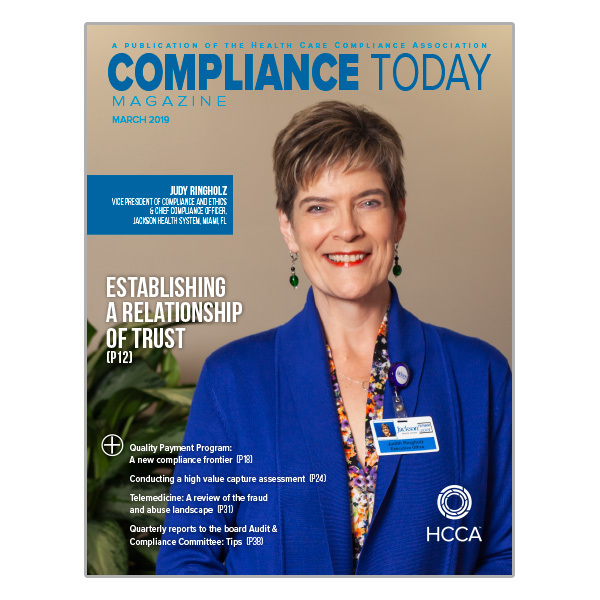 Compliance Today is HCCA’s monthly publication available only to members. Each issue provides the latest insights on healthcare compliance issues and offers practical information for healthcare compliance professionals. The growing Compliance Today readership includes chief compliance officers and compliance department staff, privacy officers and their staff, healthcare executives and administrators, in-house counsel and compliance attorneys, internal auditors, physicians and practice managers, those who are new to the compliance profession, government employees, and more. Would you like to receive Compliance Today? We highlight recent career accomplishments of our fellow compliance professionals in the “People on the Move” section of CT.
View past 2018 and 2017 issues.